Dance/USA hosted the 2018 Annual Conference in Los Angeles, CA from June 6-9, 2018. More than 500 dance professionals gathered for skill-building breakout sessions, discussions on important issues facing the field, awards, performances, and more. Conference programming was shaped around issues of equity and justice, community and collaboration, audience development, and preservation and legacy. The 2018 Annual Conference was held campus style, showcasing the beauty of Los Angeles’ local arts venues. 2018 Host Venues were The Music Center, USC Glorya Kaufman School of Dance, and The Colburn School. Browse through photos, read articles, watch videos, and find out what happened at the Annual Conference! Browse a gallery of photos from the Conference here! On Thursday, June 7, 2018, Dance/USA streamed the Opening Plenary Session of the 2018 Annual Conference from The Music Center in Los Angeles, CA. 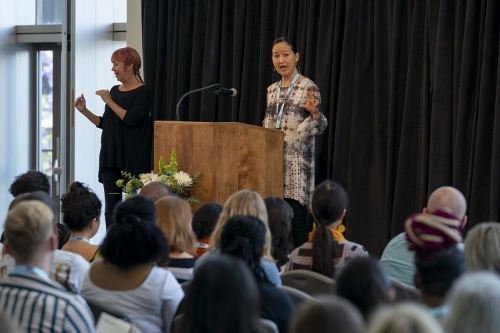 Dance/USA Executive Director Amy Fitterer made four important announcements and theater director, writer, and national arts leader Roberta Uno addressed attendees about arts and today's society. On June 6, 2018 the Opening Night Celebration kicked off the Conference with an awards ceremony when the recipients of the Honor, 'Ernie' (named for the late Ian 'Ernie' Horvath), Trustees, and Champion Awards were recognized for their contributions to the field. This extraordinary event is cause for reflection upon these individuals’ contributions to dance in America and an acknowledgement of the roles they play in the national and local dance community. On June 9, 2018, Dance/USA ended the Annual Conference with a Closing Plenary session featuring Dance/USA Executive Director Amy Fitterer, Chloe Arnold, Jacques Heim, Saleemah E. Knight, and Achinta McDaniel in an armchair discussion about the commercial and concert dance worlds. Learn more about the speakers here. If you have any questions about the Annual Conference, please contact us at annualconference@danceusa.org.